On Sunday I ran in the Amsterdam Marathon. It was my first marathon of the year and also the first time I've run in the Northern Hemisphere. It was a little bit nervy as I set out on my journey to the 1928 Olympic Stadium where the race was due to start. However, as soon as I got down to the underground platform it was full of runners waiting for the second train of the day. The collective energy of everyone setting off to the run helped me settle down. It was a cold and dark start to the day. I tried to keep my tracksuit on as long as possible so I didn't get too cold. With about half an hour to go before the start I dropped off my bag, wrapped myself in the space blanket I've been carrying round since the Great Ocean Road Marathon and headed into the stadium for the start. In the starting pen I got chatting to two English and Irish guys who were also running. We talked about nothing specific, but it was good to have a distraction while we ran down the clock to the start. There was some classical music booming round the stadium which sounded like the Dutch version of Chariots of Fire. It was a good way to get everyone in the mood. Without much of a fanfare or official countdown we were suddenly underway and shuffling towards the start line. We ran round the top bend of the running track and then headed out of the stadium. It got a bit congested as we left the stadium and we were slowed to a walk. I kept looking at my watch and couldn't work out why it didn't look quite right until I realised that I'd pressed the wrong button as we crossed the start line and hadn't actually started my watch. Idiot! It was hard to get a rhythm in the first couple of kilometres due to the crowds and I was running more slowly than I would have liked. After a couple of kilometres we reached Vondelpark and the crowds spaced out and I could strike up a rhythm. Mum and dad were waiting on the side of the road at the State Museum and it was great to get a cheer just for me as I ran past. 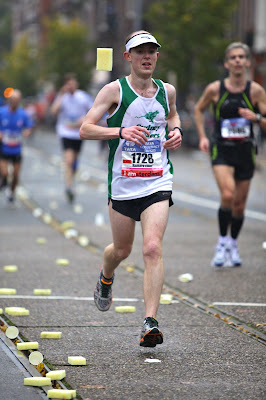 What was better at only 4km into the race I still looked quite fresh! Not long after seeing mum and dad I saw the leaders coming back past me on the opposite side of the road. It always great to see the leaders making everything look so effortless. I couldn't quite work out how far ahead of my they were, but they'd also built up a sizable lead. It's awe inspiring how quick the elite athletes can run. I had a slight headache for the first part of the run, but as I reached the 10km mark I was pleased to feel that it had gone. I'd also go over stressing about not starting my watch on the start line. I decided that rather than try and worry about estimating how far into the race (only about 200 - 300m) I'd just measure everything from where I started my watch. I'm not sure why it had taken me so long to come up with a solution, but problem solved I felt a lot better. 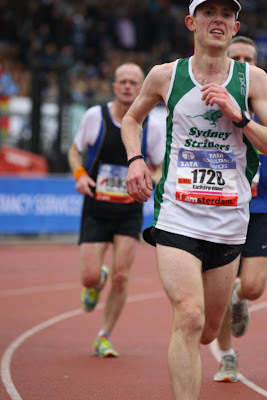 Just after the 12km mark I saw the only other person on the day wearing a Sydney Strider top. As they ran past me on a turn back I bellowed "Go Strider!" - common code back in Sydney. I was hoping for a bit of a reaction, but he didn't even notice me! Not long after I saw my fellow strider we joined the Amstel River which took as south out of the city down to the 20km mark. I got into a good rhythm heading south along the river bank. There were some beautiful houses to our right which were fun to check out as we headed past. We also passed my first windmill of the trip and a couple of barges that were floating up and down the river playing live music to the runners. Just before the 20km mark we crossed a bridge over the river and started to head north back into the city. Unfortunately was also turned into a strong head wind which made running the next few kilometres more of a struggle than you'd hope for during a race. It should have been a relief to cross through the half way mark, but I didn't really notice it as I kept my head down and tried to keep pushing against the wind. By the time we reached the 24km mark we were back in the city and thankfully out of the strong headwinds. We had to negotiate a sort brick built / cobbled track which had some nasty man hole covers sunken into the road. Luckily I managed to avoid all of them, but you could have easily turned an ankle. Grimacing on the approach to the finish. It's been a long race. Before the race as I walked into the stadium I had a quick catch with a Dutch guy who was running his fourth Amsterdam marathon. He warned me of a 'naughty' hill just after an underpass and near a drink station. This was it. The hill was a short but steep bugger. I don't think the drink station located half way up the hill helped much either as it broke your rhythm as you tried to ascend. As we reached the 28km marker I could tell that I wasn't having my best day at the office. My initial race plan was to try and push the pace at the 30km mark but I didn't feel like I had enough energy so I was already mentally putting off the 'big push' until the 35km mark. Not long after having these thoughts a loud Aussie accent shouted "Go Sydney!" from the side of the road. I waved back in appreciation. It was the first cheer just for me since I'd seen mum and dad an hour and a half previous. I decided to count the Aussie cheers and got six more before the end of the race. They were all welcome motivation. At 30km I started getting pains in my right quad muscle. I hadn't had any real aches during my training and took it as a further sign that I wasn't having a good day. The next few kms became quite monotonous as I tried to push through the pain. The crowds seemed to thin out as they always do at the 30km mark in marathons with a few people stopping on the side of the road to stretch or walk. 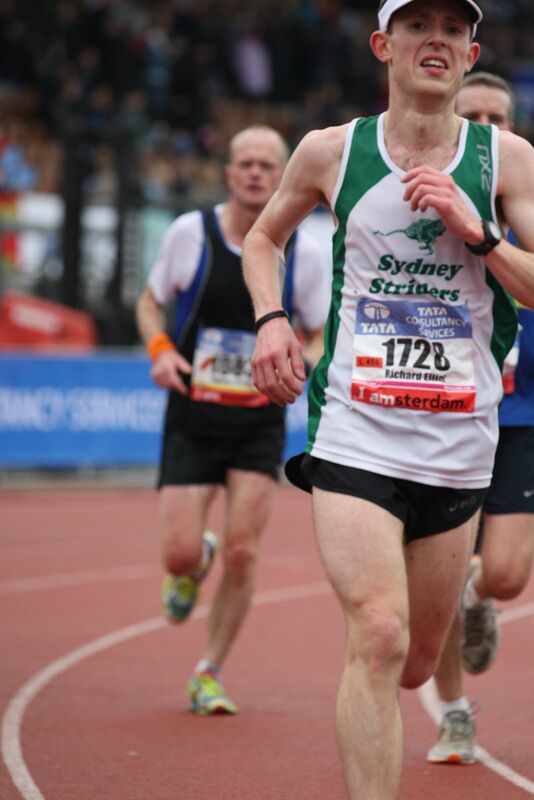 As the 35km mark began to approach I knew my only goal should be to keep a steady pace rather than try to accelerate. Perhaps I could go for a push at 37km with only 5km to go? At the 37km mark we hit the second 'hill' of the day as we went through an underpass and had to come up the other side. It was at this point my left quad started to hurt as well. Now both legs were in pain. I might not be able to accelerate, but I certainly wasn't going to give up and walk so I kept driving on. I remember hearing some live entertainment at the side of the road which gave me a little lift. At the 39km marker we headed back into the Vondelpark near where we started the race. Rather than being a bit frustrated at running the same bit of road for a second time it was a relief to know that we were near the finish line and there wasn't long to go. I wasn't really enjoying running very much at this stage! I managed a little burst with 500m to go as we neared and then entered back into the Olympic Stadium. I did my best to sprint the last couple of hundred meters round the running track as I scanned the crowds for mum and dad. I couldn't see them (and it turned out they messed up the timings and missed the finish!) 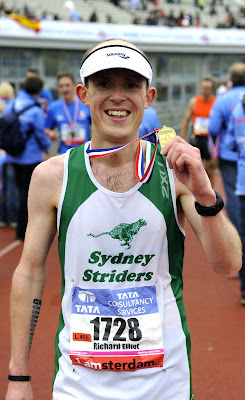 and then I was across the line to have a medal hung round my neck. I'm pleased that's over! My official result is here. I ran the marathon in 3hr 10mins 51sec, setting a new personal best by a whopping 18mins. I came 862nd out of 10,144 (top 8.5%) and 271st in my category. Top 8.5% is PRETTY BLOODY GOOD. If you ask me. Thanks guys. It was the training in Aldeburgh that definitely made the difference.